How was the Universe created? This is one question that has confronted the human mind over thousands of years. Various civilizations, cultures, religions and mythologies have sought to answer this differently. In modern times scientists too had to address this question and they could not arrive at a unique answer all at once. With the support of powerful telescopes and theoretical tools (such as Doppler effect) scientists like Edwin Hubble were able to establish (by the 1930s) the fact that we are living in an expanding universe. As seen from the earth, all the galaxies and other cosmic objects are moving away from us. The more distant the object, the greater is the speed of recession. The picture will be qualitatively the same if observed from a different star or galaxy. But a scientific theory needs support of evidence. The 1964 experiment by Penzias and Wilson provided that all important support to the Big Bang theory and the two scientists were awarded the Nobel Prize for this work in 1978. Before we describe that experiment let us have a look at the Big Bang theory and some of its implications. Following the Big Bang, the point like singularity started expanding and is continuing to do so even today. The universe just after birth was immensely hot and dense. As it expanded both the density and the temperature diminished. Till about 380,000 years after the beginning, protons and electrons could not combine to form neutral hydrogen atoms; they remained in a plasma state (White Hot Hydrogen Plasma). Radiation, i.e., photons got scattered or absorbed by electrons so often that they could hardly move. The universe was opaque to electromagnetic radiation. After further expansion and cooling (to about 30000 K) came a stage (Recombination epoch) when neutral atoms could form and photons could move about freely (Photon decoupling). Those photons, which are the earliest light of the Universe, are travelling ever since and today we see them as the Cosmic Microwave Background Radiation (CMBR). This radiation was detected for the first time by Penzias and Wilson in 1964. Now let us turn our attention to the fact that the deeper we look into the sky (i.e., space) the farther we look back in time. If someone is watching Jupiter in the evening sky one is looking back an hour in time because that is the time light takes to travel from Jupiter to Earth. An astronomer observing a star one million light years away is actually watching the star as it was one million years ago. Today, it may not even exist. That way the 13.7 billion years old CMBR is the oldest light we can see – farthest back in both time and space we can look. T λmax = a, where a = 0.29 cm0 K approximately. In figure it can be seen that λmax becomes shorter as T increases. Although this plot shows relatively high temperatures, the same relationships hold true for any temperature down to absolute zero. 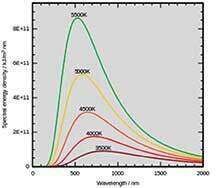 The CMBR behaves as an almost perfect black body radiation. Thus knowing its energy distribution one can find out its temperature. That such a relic of the Big Bang would exist and be detectable was theoretically predicted by a number of physicists over the years. The names of George Gamow and Doroshkevich of Russia and Robert Dicke of America can be mentioned in this connection. It was also computed that the originally very hot CMBR should now have an energy equivalent to a black body at 40 K, that is four degrees above the absolute zero. This is so because of the Cosmological Red Shift which lengthens the wavelength of a photon as it travels through expanding space. The wavelength increases in proportion to the size of the universe. Moreover, since the universe at that time was not differentiated, there was no directional preference, CMBR was supposed to come uniformly from all direction in space. All these details had already been worked out by 1964 when Penzias and Wilson did their experiment. Usually a scientific experiment is set up in anticipation of a particular result. The much talked about experiment of the recent past – done with the Large Hadron Collider at CERN, Switzerland – was set up to detect the elusive particle Higgs Boson. (God particle is a misnomer.) The Michelson and Morley experiment, discussed in this section, was designed to detect the effect of earth’s motion through ether on velocity of light. Even the null result of that experiment revealed something very important. 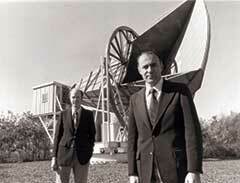 Penzias and Wilson, on the other hand, discovered the Cosmic Background Microwave Radiation (CMBR) quite by chance. In 1964 they were working at the Bell Lab at Holmdel, New Jersey, on some experiments related to radio astronomy and satellite communication which included listening to faint microwave signals from the Milky Way galaxy. They were not looking for CMBR. 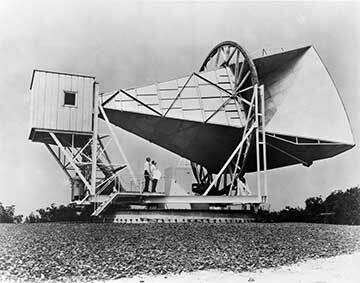 For their work they were using some specially designed hyper-sensitive ‘horn’ antenna. During ordinary radio reception one always gets some noise in the background. (This is very prominent between the signals of two consecutive stations in a radio.) Penzias and Wilson also expected some noise and were prepared to negate its effect through proper means. They had an estimate for these expected noise. But over and over again they were getting an excess noise which they could not account for. At one point the noise was thought to be interference caused by pigeon droppings on the antenna equipment. Pigeons were trapped and their droppings were cleaned from the antenna. But the noise persisted. Ultimately Penzias and Wilson realized that the noise was an actual signal. It was equivalent to a temperature of 3.70 K. This signal was present day and night and was uniform in all directions of the sky. They were convinced that it was not coming from our galaxy but were unable to locate its source. At this point they contacted a group of scientists led by Robert Dicke in the Princeton University who had been working for a long time on the CMBR and the possibility of its detection. Together they arrived at the conclusion that what had been detected was indeed CMBR. Penzias and Wilson published their results in 1965 and, as mentioned before, were awarded the Nobel Prize in 1978. Their finding is considered to be one of the most important discoveries of 20th century physics. It is also a classic example of serendipity in the realm of scientific discoveries. The First Three Minutes: by Steven Weinberg, Basic Books, 1977.